Alexander the Great stirs the imagination of almost all of us. He is without doubt, one of the greatest conquerors of all time. His victories fused two great cultures and provides the wargaming historian with many ponderables and possibilities. In Alexander the Great: the Wars of Philip and Alexander. we provide for you the great armies of this period so that you, the historical wargamer, can recreate the various armies and battles of this great period in military history. The armies of Philip at Chaeronea and the Greeks he fought; the invasion army of Alexander as he crossed the Hellespont and the army of the 'Great King' Darius III; the new army of Alexander that he took into India, as well as the armies of Porus and even Cangdragnupta, are all detailed here for you to study and recreate. Within the framework of this module and 'Ancient Empires', now you can become Alexander at the head of his Companions at Issus or Guagemela. As Porus, now you can attempt to end the conquests of the invincible Macedonian conqueror! All of the great campaigns of Alexander are listed here within the covers of this module for you to study, analyse and recreate. 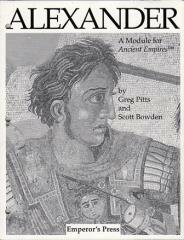 This module is the fourth released for use with 'Ancient Empires' rules system.